With advances in technology and growing focus on customer retention, thousands of organizations have considered, and many have adopted customer loyalty programs for their businesses to build and nurture strong relationships with their best customers. Customer loyalty is considered as the roots of a successful business and reward programs the most popular and proven method for creating customer loyalty. The relationships aims to create long term loyalty and can also be achieved by taking advantage of every opportunity to learn more about each customer as an individual person. It is one of the hardest qualities to build among customers, and most critical to the success of any business. Loyalty and Reward’s programs have been around for years and few are very old and established. Ecommerce businesses have option to either start fresh and create their own program or join an existing one and extend the same to their customers. 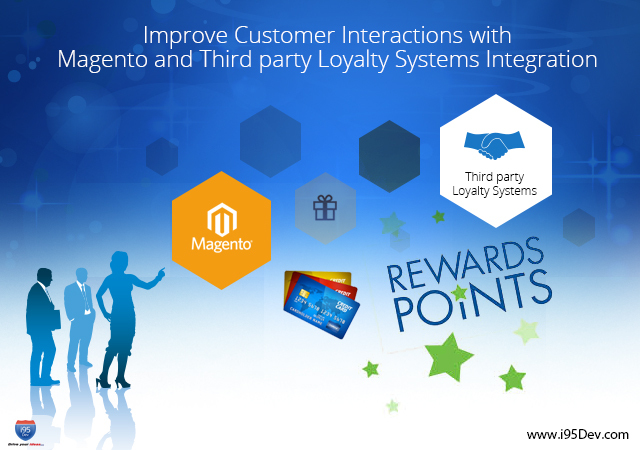 We, i95Dev, have recently successfully integrated a third party rewards system, Accumulate, with Magento ecommerce for a client. The client had a tie up with a popular airline company to allow customers to purchase products on their ecommerce store using the rewards points collected by them (they received on making a purchase from any of the partners in the network). With immense smart work and dedication, i95Dev doyens made this critical project possible within time line. As the client required their ecommerce store to support split payment, we extended the infrastructure by customizing Magento front end and the back end thereby enabling such payments by finding a common language for communication. Adding further to the solution, we extended the client’s application by integrating it with third party rewards system in real time for reward point validation and configured the required APIs in the system for easy access of client’s customers for multi payment options. Proper integration with the server helped updating the reward points in the system once the payment is over. But complexity with Payments was still not over as we were yet to streamline the same completely. So, after the payment is captured, we made the information available in the order/ invoice history; both at client level and Magento admin level. The client has an ERP system which integrates with Magento ecommerce store in real time (integration by i95Dev) mode to streamline and automate their entire business process. Our team built the business logic thereby integrating the systems so that the information is synced back to the client’s ERP system. To know more, please feel free to connect with us at http://www.i95dev.com/contact/ or give us a call at 301.760.7499.